Janet Oliver earned her B.F.A. from UNCG in 2000, and her M.F.A. 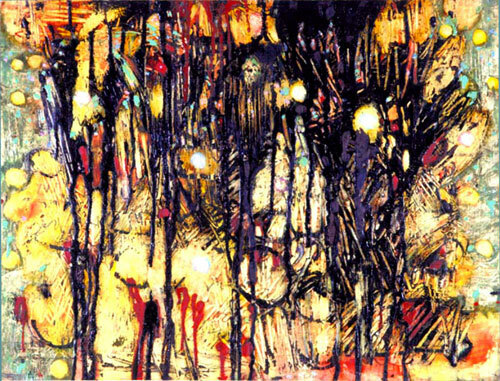 in painting in 2002. Between 2002 and 2005 she was a full-time lecturer in art history, taught introductory drawing, and served as the Visual Arts Curator in the UNCG Department of Art. Amy Lixl-Purcell, also in the Weaver Collection, was one of Oliver’s professors. She encouraged her to experiment and to take chances with her painting. No Reply was started as a letter to Janet’s father. She began work on it in portrait format, writing down, with paint, “all the words she never said to him in person”. She worked over those words, adding new words, scraping or scratching off others, until they became unrecognizable, adding to the “chaotic confusion”. At that point, she turned the canvas 90 degrees and began working in the landscape format. “This was a liberating factor, and allowed me to in essence, rediscover the buried letter, and to re-envision it as another kind of narrative, an emotional one.” A prominent substance in this painting, asphaltum, is a transparent brown to black-brown mineral pigment obtained from natural deposits in certain areas of the world. Oliver’s work has been included in Art on Paper at the Weatherspoon Art Museum, the Winter Show at the Green Hill Center for North Carolina Art, and at Gallery 115, among others. Her work is also in numerous collections.